"Having a weld brake although not common, does happen. Trailers are simply hard on tires and wheels. Whenever there are axles close together the lateral forces applied to the tires and wheels when turning are tremendous. This is particularly true when turning at low speeds like in campgrounds and in-town driving. Inflating trailer tires to the sidewall pressure will help them run cooler with less heat buildup as well as minimize the lateral forces applied in tight turn situations. These forces take their toll on the wheels and tires and failure will normally occur when the tire and wheel are at their highest temperature, i.e. running at highway speeds. 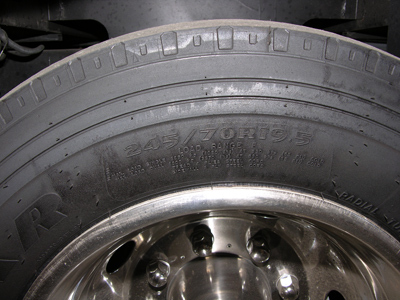 Tires and wheels are matched to work together, in most cases this is based on air pressure ratings, if tires upgraded from an 80psi (load range E) to the 120psi (load range G) without upgrading wheels it could cause a problem. There is little one can do about the sideways forces other than to try to make as wide and smooth low speed turns as possible and avoid sharp tight turns. Aluminum wheels are normally milled from a solid block and do not experience the same type of problems as welded steel wheels."